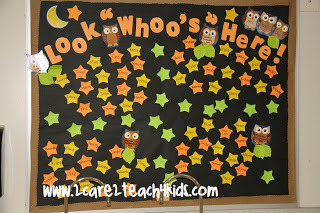 Minimal or not, use these ideas and resources to make your bulletin boards the best they can be! This simple board was created using Carson-Dellosa "Assorted Owl Cut Outs", punch out letters, and star shaped Post-It notes! The stars have children's names on them. This was a year when there were four sections of preschool so that is why there are sooo many stars!